Professor Ron Davis served at UMaine’s climate school for over 30 years before retiring, and in the decade since has improved his home and lifestyle to the point where he and his wife consume almost no fossil fuel. He is also an avid bird photographer and took time from a recent trip to Nome, Alaska, to talk to us about his solar efforts. Could you tell us a little bit about your background? 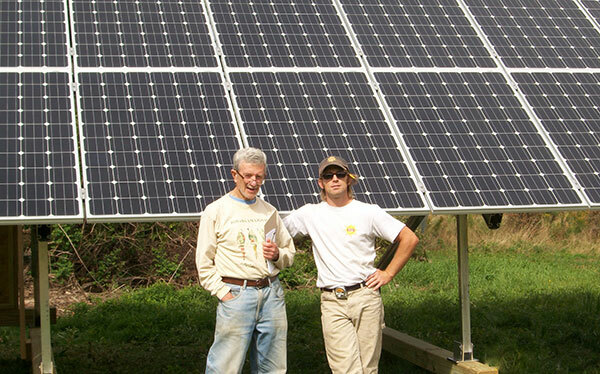 How did you get interested in solar? I’ve been in Maine since the 1950s. I taught at Colby for 10 years before moving up to UMaine at Orono to join the (then) just-starting Climate Change Institute. I worked there for over 30 years before retiring in 2003. My focus was on paleoecology, reconstructing past ecosystems by analyzing pollen and other remains in lake sediment and peat. These deposits offer us clues about the ecosystems and environments of the distant past and the living conditions of the ancient peoples. Of course, all this helps us to understand climate change and what is normal and what is outside the norm. The understandings I acquired in my teaching and research have had an impact on how I act as an individual living on this planet. As a scientist, I believe in the scientific process and what scientists are saying about climate change, especially as I have evaluated the findings of climate scientists from my own critical point of view. My wife, Lee, is also a scientist and shares this point of view. Through that lens, we feel a powerful sense of responsibility in regards to our personal consumption of fossil fuels on this planet, and we set out to do something about it. So what pushed you to go from solar enthusiast to solar customer? With the LEAF, we find we hardly ever need to use our regular car (a Toyota Prius) except for when we go on long trips. Overall, we have gone from quite a substantial carbon footprint for our household and local transportation to almost none. How’s the solar life? Anything else on the horizon? We are excited that our work has inspired others in our community and we are now working with a local (Orono-area) group to discuss progressive issues ranging from environmental justice to peace-making. We’ve opened up our home for others who wish to see how they can combine all of these technologies together to save money and greatly reduce their burden on this planet.